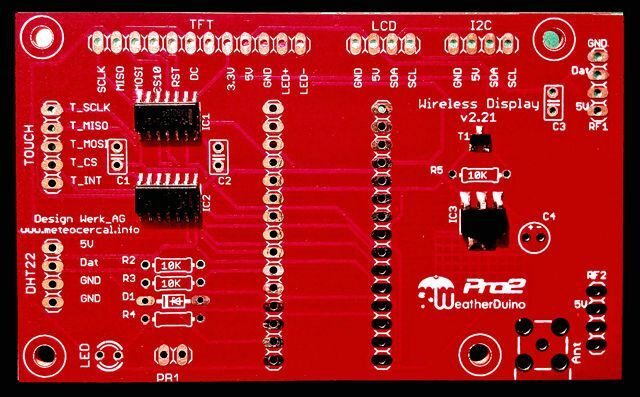 The WeatherDuino Pro2 Wireless Display units become a very popular part of the whole WeatherDuino Pro2 system. Several users are now using two or more units at their living rooms, bedrooms, kitchen or all other places, where they want to have the weather info available. Due to this sucess, we have developed a new board which makes its use even more easy. To control the functions, just touch the screen! Turn backlight off by just touching the clock area on the display. Turn backlight on by just touching anywhere on the display. Show Extra Sensors screen, by touching on the right side of the display. Show info about your TX units, by touch on the left side of the display. There is already available a new WD software with support for these new WD v2.2x boards. You can download it here. 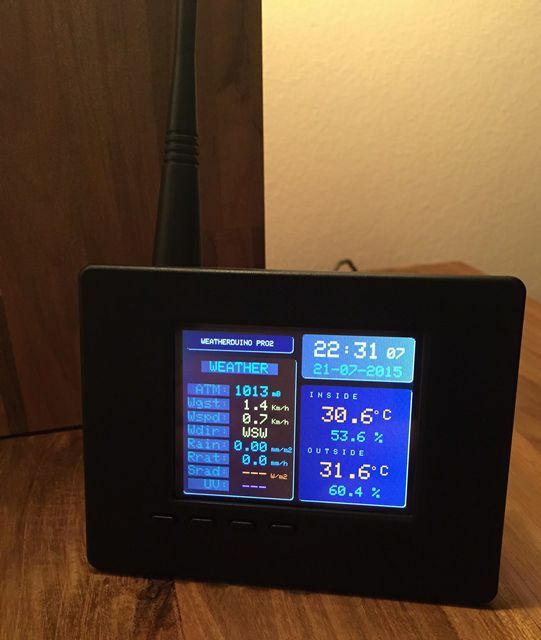 Wireless Display Unit running WeatherDuino Pro2 v2.0 software. Note: The Wireless Display Units when used with the Pro2 PLUS system have even more features. I really like these WD units, I have five of them, two with the touch panel. Current time: 26-04-2019, 09:39 Powered By MyBB, © 2002-2019 MyBB Group.